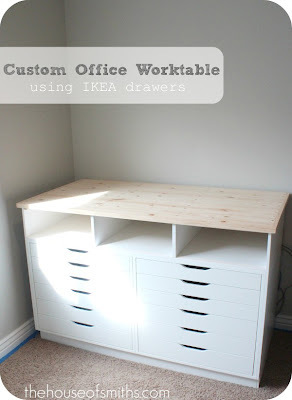 If you remember from our last post, we custom built this worktable around two Ikea draw units. 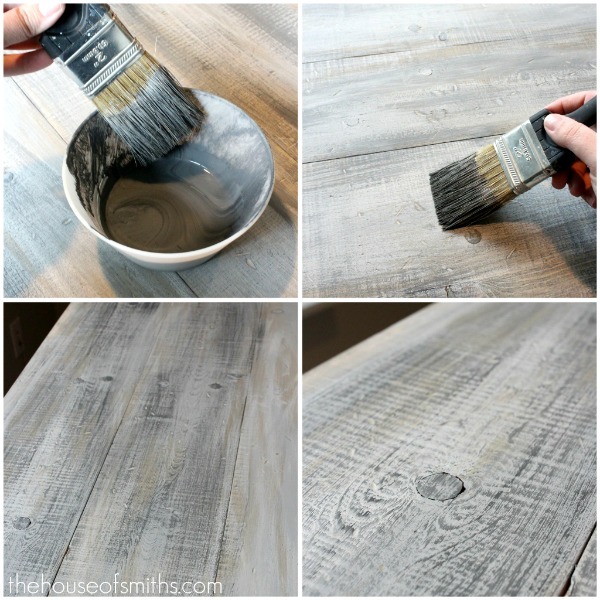 The last step is to apply another coat of your Olympic weathered barnboard stain to the top of your wood. You can do a full coat of the stain, but I just used the dry-brush technique again and ran the stain lightly over the whole surface. 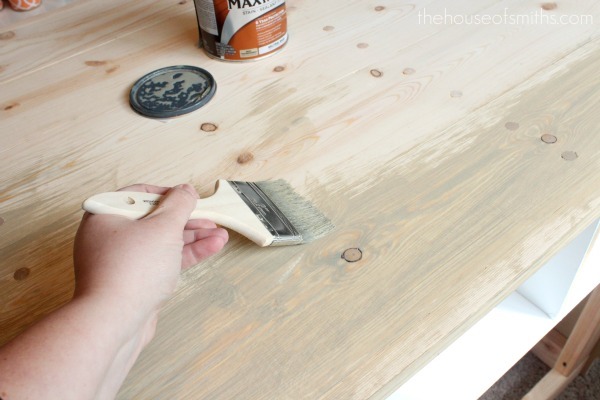 Adding the stain to the top of the mostly dry latex paint will almost give the surface a greenish-gray tint. Helping add to that worn look that you're going for. that looks great Shelley, what an awesome tutorial! Thanks for the tutorial Shelley! It looks so beautiful and I'm so jealous! My husband can't build anything! Boo. Enjoy! Have a fabulous day! You're genius! Love the whole "look"...the baskets, the tags...and of course the awesome "barn wood"! Have a great day! WOW! Amazing work on that! I cannot WAIT to see the final review. 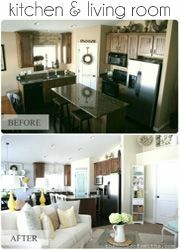 I saw you on HGTV the other day...you did a fantastic job. I really hope to meet you in person at SNAP! Wow, that really turned out great! And I love the frames on the baskets. I can't wait to see this room all put together! i love this technique! thanks for sharing! my boyfriend and I just finished up a wood chest for our basement and I wanted to do a rustic barnyard wood finish on it...this would be great on it!! So going to try this on something. Hmmmm, now what project should I start now.... hahahaha. That looks awesome! I want one!!! AH. MAZING! Love this! You are SO creative!!!! It looks great, I love the treatment! wow love the look! I think I would like to try this on a old board sign I am working on! Love how it turned out! I've done some dry brushing in the past and I've always been happy with the outcome. I'm normally not a huge barn wood fan (you know, splinters termites and bugs) but I really love how yours turned out! Gorgeous! i LOVE IT! 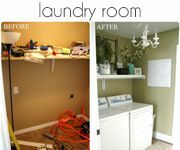 I think i may attempt this one for my scrap room! Thanks for the great tutorial! I LOVE it! I think i may attept this one for my scrap room! thanks for the grea tutorial! Wow, I like it! I've often thought about somehow refinishing our kitchen table. It's one of those Ashley furniture natural colored wood tables that everyone has. Of course I could skip the distressing step since I think I have an adequate number of authentic scrapes and dents. It still wouldn't have the individual wood slat like though. What do you think? 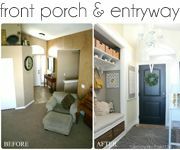 Great tutorial can't wait to apply what I've learned and try it on something in my home! Oh man that looks amazing! I love the contrast of the new with the worn and those baskets! I have done a treatment similar to this, it's hard to describe, you just have to play with it until it looks like you want it, but you explained it well! I can't wait to see the rest of the room! I absolutely love how the top turned out! Thank you for the tutorial! I cannot wait to try it! This is beautiful! I love the final product. You should leave this way and not put the clear coat. The more banged up the more character it will have. Great job! I'm totally following your blog. Love this look! Thanks for the step by step as well! 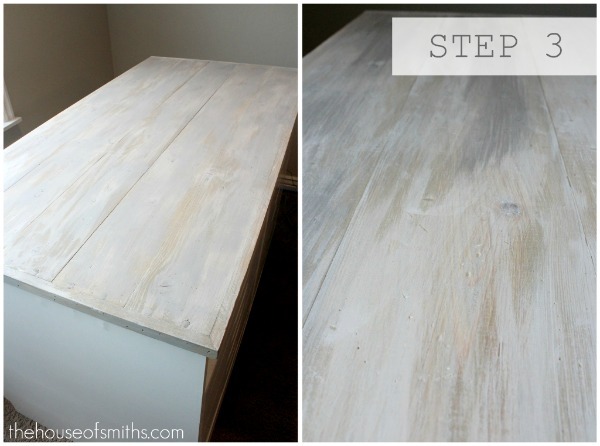 Love this tutorial and how your cabinet turned out! Can't wait to try this technique. Love the baskets! Where do you find baskets like that? What a great tutorial! Your blog is fantastic! I'm really looking to your next post! Wonderful tutorial. I've got to try it somet ime! What a great project. Thanks so much for joining my party! I'm pinning this in case I want to make a backdrop for an in home studio ;) Where are the itty bitty frames from? Thank you for the awesome tutorial. I can't wait to try it out! Where did you find the small frames/tags on the baskets? That unit looks amazing!! What fab storage!!! The wood looks great! So excited to see the continued progress of your new office!!! that looks really really good. I was planning on making a top for my coffee tables (I have 2 tables side by side side that I want to have linked together http://www.icancraftthat.com/2011/02/coffee-table-enhancement.html) and this just might be the solution for the top. they are getting really banged up and I was contemplating replacing them but they are the perfect size for my room and for storing my Ottomans. Oh my gosh! I love this!! You are amazing, my dear. Absolutely fabulous! Gotta do it! Thanks! can't wait to try this. unfortunately i have to strip the table first, which i dread. Wow, wow, wow!! Thank you for the tutorial! It looks so great! Can't wait to see the room come together! Looks amazing with the baskets and the little labels!! Wow, this looks awesome!! I can't wait to try your technique! Love, love, love the look of the white with the wood top. Looks wonderful! 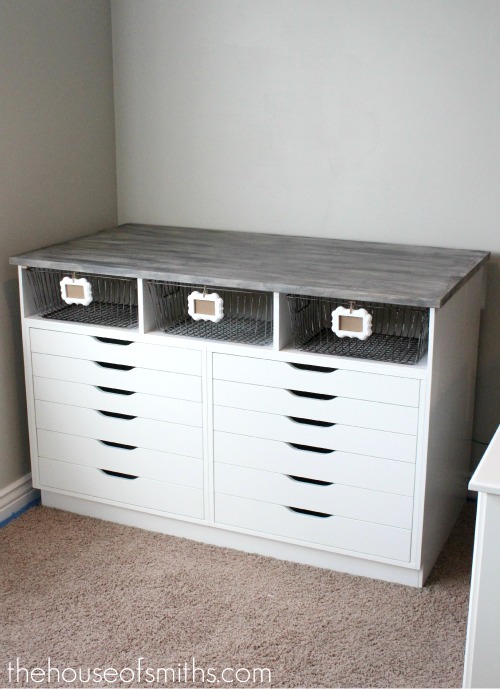 Where are the white drawers from? I have become a recent follower of your blog and I LOVE your style. Do you do any design consultation on the side? Also does your friend Shauna, whom you mention in your post run a furniture painting business or does she only do your stuff because she is a good friend like that? Wow, I can't get over how you take simple things and turn them into amazing awesome creative pieces of pure greatness!!! LOL! Seriousness! I LOVE this! What a great piece of furniture/storage for your new office! HATS off to you miss shelly!!! Where did you get the tags/frames hanging from the baskets? Hi! I found your blog last week, I think from Pinterest. I just wanted to say, WOW! I'm amazed at what you do, I've been all over your blog...yes, kind of stalking it...please don't judge me...but wow! You are amazing and so inspiring with what you do with your home. Just wanted to say hi, and thank you for all of these awesome tutorials! I'm afraid now my husband might come home and find me pulling something apart or tearing down a wall and if you don't mind, I'll just blame it on you if he gets made at me...would that be okay? ;) Just kidding, but thank you for this amazing blog, I'm a new fan! That would make for a great scrapbooking table.....hmmmmm Love it! Looks great!! Where did you get the wire baskets? Love this look! Love this look!! GREAT job. Where did you get the wire baskets? Ooooooo I love this!! Thanks so much for sharing your tutorial! I pinned this and will most definitely be using this technique! This looks great!! I've wondered many times how to make the wood look like it's been weather, but I never thought of using just paint! Ha! Your table looks great, and I love the little baskets that you have in it too. I'm lovin it! Thanks for the inspiration. Been wanting to do this look on a couple things back here at my homestead:)! Sharing this as one of the features at my Wow party tonight. Thanks again for joining. That looks fabulous! Thanx for the how to! Definitely going do this on my fireplace makeover. Hi: I just found you. Nice turorial! Do you happen to host any linky parties? I would love to show you some of my stuff that I've been working on. Thanks for a cool blog! This is really a great technique. How did you even begin to come up with it?!? Thanks for sharing. nice work you've got there! I'm in charge of table signs for my cousin's wedding next weekend, and I wanted to do them in barn wood frames, but of course those are insanely expensive. Instead I got some cute unfinished wood frames at Michael's for $1 each, and I'm going to try your faux barn wood technique! Thanks so much! 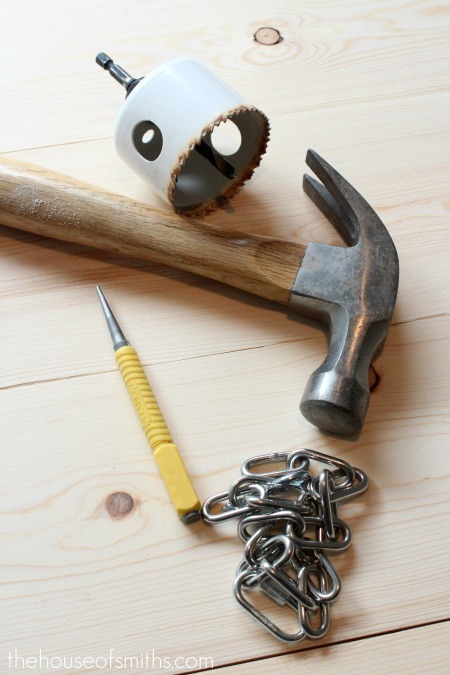 What a great tutorial, I have been thinking about trying something on some new wood, you have inspired me. This is great, I have been trying to figure out how to make some new wood look old and bam, here you are. Thanks so much. Can this be done with a "French Country Kitchen Table"? You know the one that has the wood table top, and sitting portion of the chair, but the legs and chairs are white? I hate , hate my kitchen set and want to do something different. I wonder if this could be done with the French country kitchen tables? the ones that are white legs and backs of chairs and table. The table top and sitting portion of the chair is wood but the rest is white. I'd love to change it to look something like this. I just found your post through someone's Pinterest board I'm following. I love your line at the end as much as the project: "PLUS you feel all artist-like... mixing paint and flailing your arm around, quickly dry brushing everything." Ha! It's so true and I would feel like my artist sister when I do that. How fun to have a project that creates such a sense of the dramatic. Love it. Hope you'll stop over and see me at Quirky Vistas sometime. Cool...I just bought a wooden workbench off Craigslist and wanted to do something with it...but nothing too "perfect" since it is, after all, a workbench. This would be awesome. Thanks! I love this! 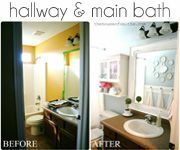 Now instead of looking for some old barn wood for my bathroom vanity I am just going to do this. Thank you so much for this tutorial. I love the look of your faux barnwood! I wanted to do a rendition of it today, but couldn't find the Olympic weathered barnwood stain - where did you buy it? I do a lot of projects with old fencing, like this: http://house-capades.blogspot.com/2012/07/hi-my-name-is-callie-and-i-built.html (we had a whole fence blown over in the tornado that hit our house this spring) and I think this look would be great even on my pre-distressed fencing wood - can hardly wait to try!! 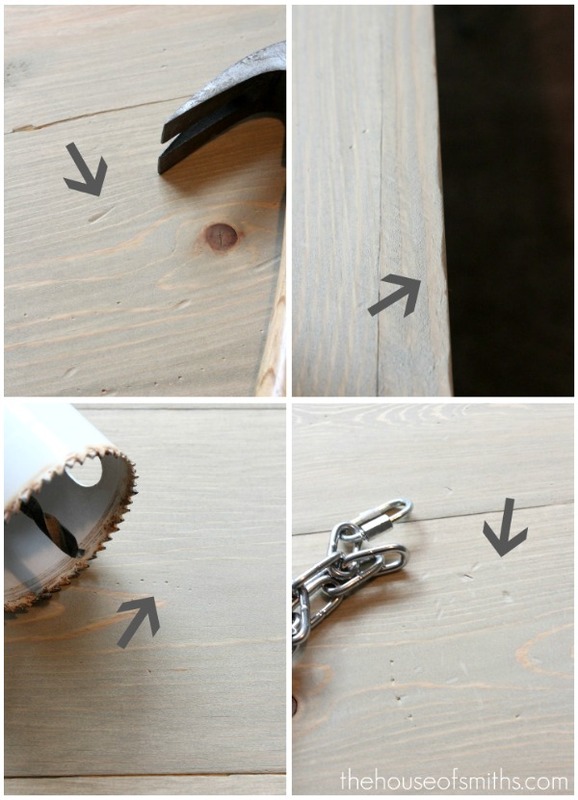 I also am having a hard time finding the stain to do this....i almost spent all the money on real barn wood so thank you so much for sharing this great idea :) Please help us locate the stain! The stain is at your neighborhood Lowes in the exterior stain section in the paint department c: it comes in a variety of colors and the paint desk will be more than happy to mix your color for you! She used a semi transparent stain and sealer from Olympic. Is there anyway I could make the stain like this but brown? Love this tutorial! Would love to know where you got the drawer unit. Looks like something I need for my craft room. Look at this! Fantastic, it looks wonderful on the cabinet and isn't it the best to have a surface that will only look better with use?! Hi! I really love what you did here! It looks really cool! I have a question for you, my nephew has been wanting an American Flag for his birthday, and I was planning to make him one out of a wooden pallet. Can I use the same technique above by adding red and blue acrylic paint to the flat paint mix to achieve the worn/rustic look?? Thanks!!! Very cool! I appreciate your step by step, I will definetly give this a try. Thank you for the info!!! I love this kind of stuff! I have been doing different finishes for a while now and I find that using a paste wax like minwax sold everywhere, for the last coat gives it a really great feel and look. Put the minwax on heavy its hard and softens with the heat of your hands. Then let sit for about 10 minutes, buff the wax, try to get as much as you can out of crevises and cracks. Great look! You have no idea how long I've been looking for this technique, it is great finally reading how to do it. The finish is in many magazines, but never with directions or a posted website with directions on how to achieve it. Thanks for leaving these directions I'm going out today and buy the supplies. You have no idea how long I've been looking for this technique. It is wonderful seeing it finally used, and not just on a piece of furniture in magazines. Great post and its look wonderful. i like it. i live your style. thanks for sharing with us. 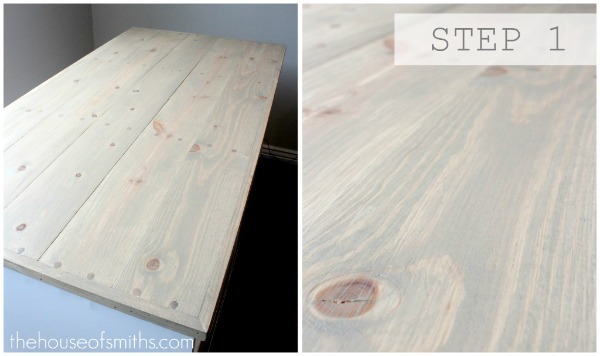 Where can the Weathered Barnboard Stain be purchased? 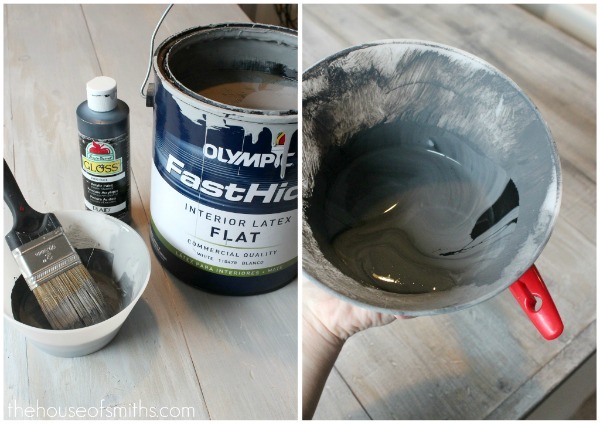 I have tried Home Depot, Lowes, Sherwin Williams, ect. and no luck. Please let us know. Thanks! This was totally helpful in my latest Pinterest adventure- thanks for sharing! 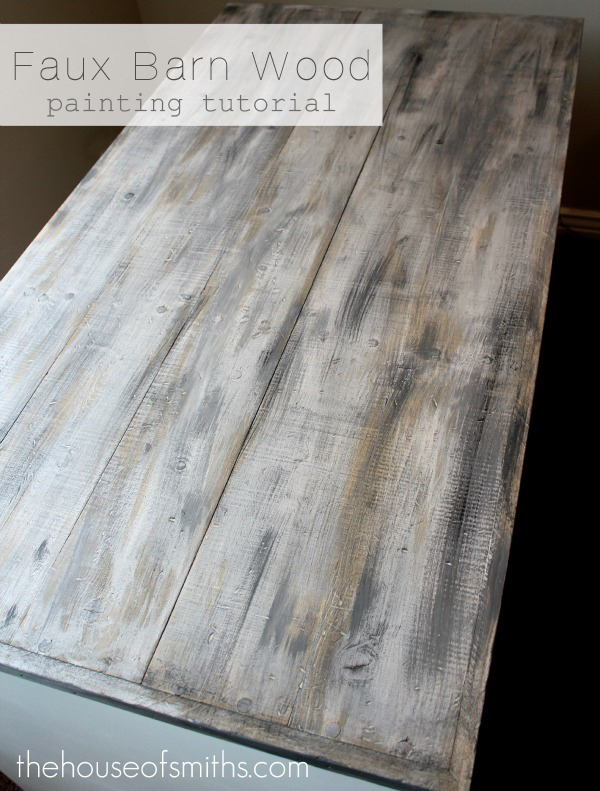 You've done a wonderful job weathering that table top - just beautiful and I've got this linked to my weathered wood DIY post too today! 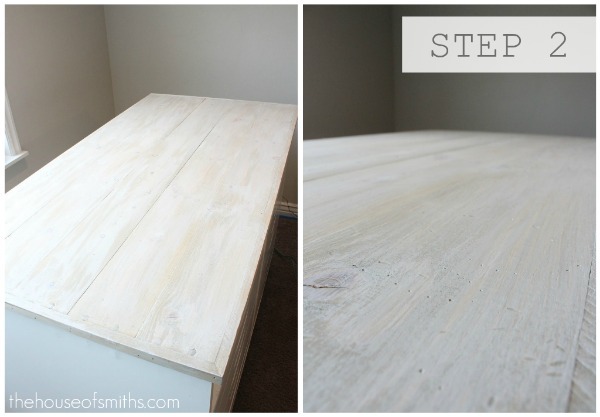 I'll be doing this this weekend to top of some ikea nightstands. I'm so excited. Thanks for taking the time to show step by step, what you did. Great job! Great sharing! Now it is my turn to give it a go! 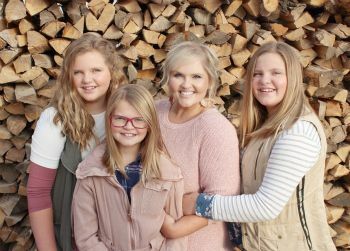 I absolutely love your work...not just the outcome of the wood - which is the EXACT look I am wanting to create...but also the way you do the step-by-step photo and explanation of how everything is done! TRULY BRILLIANT! Well done...I have bookmarked your page...definitely going to see what else you get up to!!! So I found the Olympic Stain at Lowes... Make sure you get the neutral base and they can add the 917 Weathered Barnboard tint to it(it's a semi transparent stain). I was not able to find a small quantity of the stain, they only stock the full size which is approximately $40. Love this! Where did you get the mini white frames and bins? Love this! Where did you find your mini white frames and bins? Is there a way to add a layer of brown stain over top? Do you think it would mess up the textured/layered look? I am more of a fan of the brown stain, rather than the grey. Fantastic tutorial! I love this look. 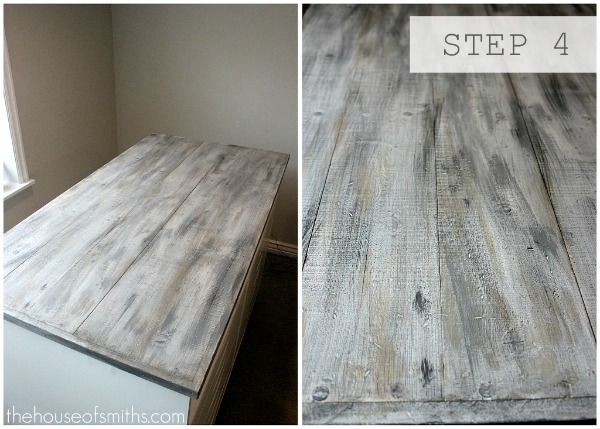 Can't wait to give it a try and I have the perfect coffee table just waiting to be finished! 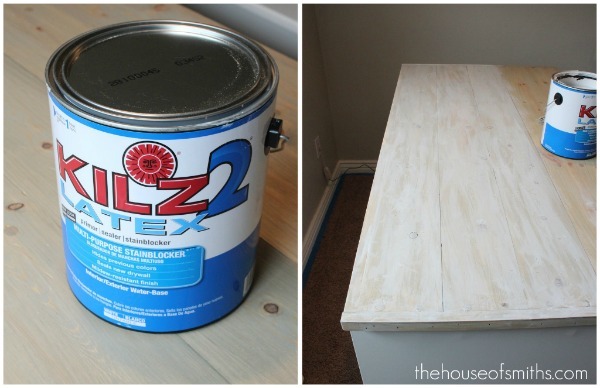 I am curious about the stain and then paint, I recently stained wood with an all in one stain & sealer. Then painted over it with Latex paint. I had someone want to purchase a similar item so I checked with the manufacturer & they said that I should not paint over the stain/sealer combo. My piece is fairly new (2 months old) with no issues. How is your holding up? I really want to make more items with this combo as cabot makes some beautiful colored stains right now! 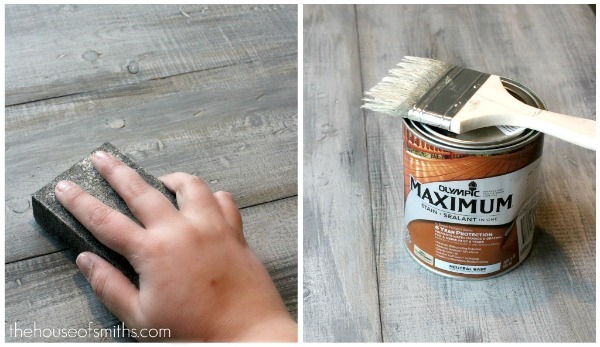 I just used this on a coffee table top and it looks great! Thanks for sharing! Can't wait to use it on some other projects.